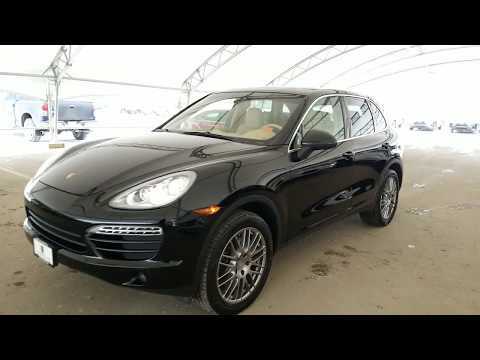 This 2014 Porsche Cayenne Premium Package comes equipped with Navigation, Backup camera, Park assist sensors, Panoramic sunroof, Power folding side mirrors, Electronic parking brake, Electrochromic inside rear view mirror, 14 way power adjustable front seats with memory seating, Panoramic sunroof, Power tilt and telescopic steering wheel, steering wheel mounted controls, USB/Auxiliary ports, Bluetooth audio with hands free calling and much more! Purchase with confidence with a Royal Advantage Vehicle. Royal Advantage vehicles are covered under our Powertrain 120 Day or 8000 km warranty or the remainder of Factory Warranty (whichever is greater). It has been through our rigorous 103 point inspection, performed by one of our journeyman technicians. The vehicle is completely detailed and re-conditioned as you should be as confident about your purchase as we are about our sale to you. We are completely transparent and will provide you with a full disclosure inspection report and Carproof as well as complimentary membership into the Lexus of Royal Oak Royal Rewards Program. Complimentary tank of fuel and 1st Oil and Filter service. AMVIC Licensed dealer. Though we are the new luxury dealer in Calgary, we have already established our reputation for taking care of all of our Guests. Check our Google Reviews! Contact at 403-296-9600 to schedule a test drive today! All prices listed on our website is the price you pay plus GST.